How Can We Be Strong in the Lord? Day 2 of Twelve Days of Christmas, we welcome Ruth Snyder talking about being strong in the Lord. I started my morning with prayer and Scripture reading. My heart was especially burdened for our family. I prayed for God’s protection and was quiet before God. My heart was filled with peace when my devotional time was finished. Less than an hour later, my husband and I were embroiled in a heated disagreement regarding our children. The longer we talked, the more we disagreed. I retreated to my piano to play hymns and reflect. Why couldn’t we resolve this situation? Kendall and I both want the best for our children, but sometimes we disagree about what this looks like. We are learning to use tools like John Gottman’s Sound Relationship House (https://www.gottman.com/about/the-gottman-method/). Life on earth is full of challenges and problems. Sometimes we get totally overwhelmed. Cancer. Addiction. Family issues. War. Abuse. God is the only one who is big enough, wise enough, to have the solutions. We need to choose to be strong in HIM. He will give us the victory, if we trust him and not ourselves. According to Strong’s Concordance, the phrase, “be strong,” comes from a root word that means to enable, empower, strengthen, or be made strong. Remember the apostle, Paul? We may see him as a spiritual giant, but he claims that God’s strength is best displayed in our areas of weakness. When we feel strong, we don’t rely on God the way we should. In fact, when we have the ability to do things well, we often boast and become proud. When we realize we are weak, God is able to work through us to display his love and power to those around us (1 Corinthians 1:26-31; 2 Corinthians 12:9). God enabled Samson to defeat Israel’s enemies, but when Samson chose to disobey God, he was captured (Judges 14-16). God chose Saul to be King. When Samuel took a while to show up, Saul took things into his own hands. Then he disobeyed by not destroying all of the enemy, and God took the kingdom from his son and gave it to a lowly shepherd boy, David (I Samuel 9, 13, 15). Have you experienced God’s power in your daily living? What difference is it making in your life? Journal your thoughts, or respond in another way that is meaningful to you. Thank you that you are all-powerful. Help me to remember that without you I am vulnerable and weak. As I walk through this day, lead me. Help me to be sensitive to your voice and obedient to your will. In Jesus’ name, Amen. 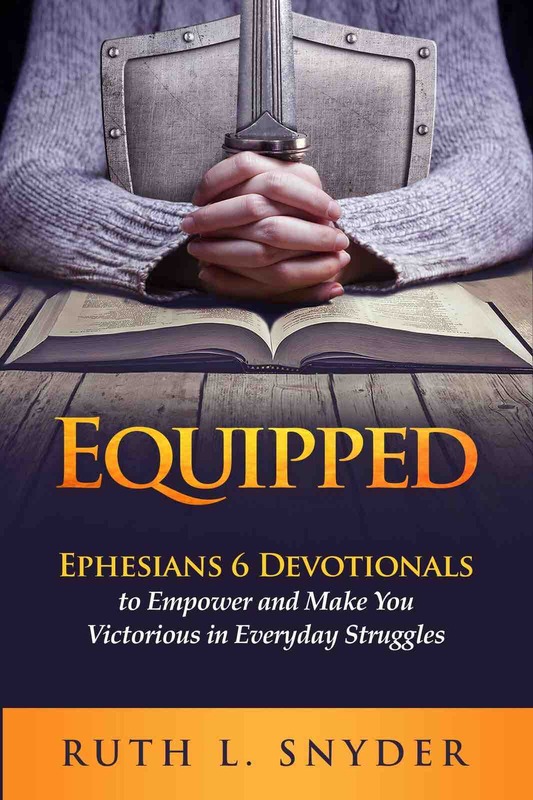 Ruth would like to invite you to join a FREE 10-Day devotional challenge. You will receive 10 free devotionals and access to a private Facebook group to discuss the devotionals, apply them to your life, and pray. I haven’t read this book but knowing Ruth and her heart for God, this will be a good one. 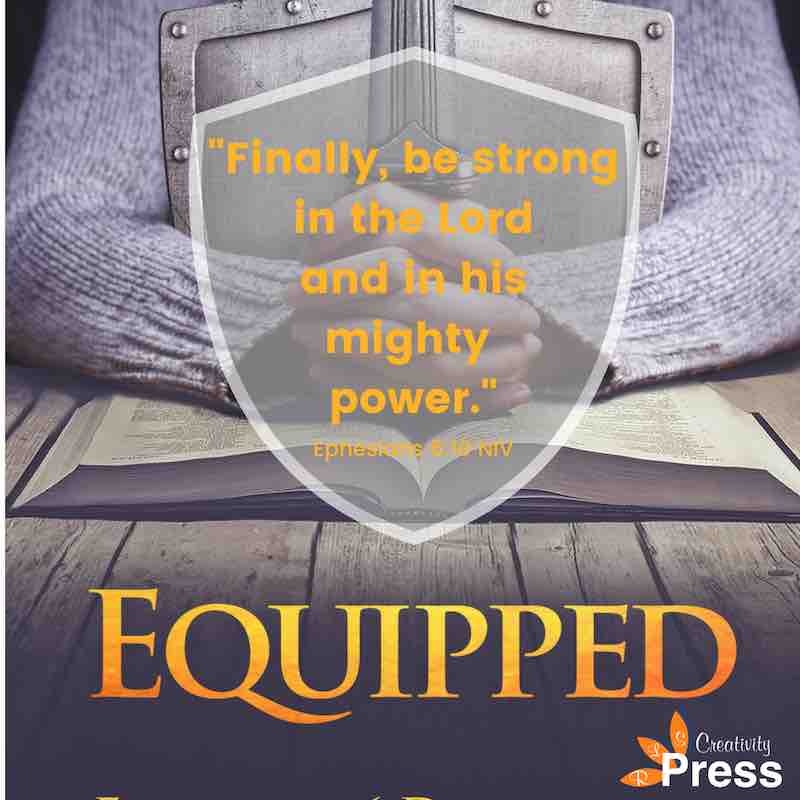 This entry was posted in Books, Guest Post and tagged Be strong in the Lord, Equipped, relationships, Ruth Snyder, Twelve Days of Christmas on December 14, 2018 by JanisCox. Oh did I laugh when I read the last title of this blog hop. What is my current work? As usual I have all these ideas and no time to focus. Here are a couple of paintings from my new children’s book. But my current work is to focus on what God wants me to do. For that reason I will be taking a month’s sabbatical starting on April 10th. Except for Sunday Stillness which I will continue to put up. Under the Cover of Prayer – this is my first love and I am struggling with leaving it for a month but know I must do so. Family and Faith Matters – I write twice a month and think I can have those finished before I go on sabbatical. Inscribe Online – I write once a month and think I can write that before I leave. and my own blog – He Cares for You – Other than Sunday Stillness – it will be quiet around here. As for ideas I have two children’s books written. I am working on the illustrations. I have two devotionals in the works – Living Life – One Word at a Time and a book about prayer. And we are moving back to our residence in Canada. That is always an adjustment. So time away will be good for me. I would ask for prayer for discernment of where to put my focus. Stay tuned and I will tell you what God tells me. And don’t forget to take a look at my published work – Tadeo Turtle – a story for children ages 2-7. Tadeo won the best children’s book for 2013 by The Word Awards. Tadeo Turtle isn’t happy with his cumbersome shell. He wants to be free to run and play like Sammy Squirrel. In a dream his shell falls off near a stream. He runs, plays and has fun. All of a sudden CAT appears. Tadeo can’t outrun the CAT. He hides and longs for home. He finds his shell just in time and is safe. After he awakes from his dream, he realizes that God made all the creatures with special attributes and that he is special just the way he has been made. You can order directly from me for a signed copy and a special batik watercolour card as a gift. Or go to Tadeo Turtle to Buy for other options. Sixth in a series of a Writers Blog Hop held by Ruth Snyder. Our first blog hop can be found at Ruth Snyder. . Writing Goals for 2014. Click here for the third blog hop on the topic. Hero. Our fifth blog hop was What genre do you write? This entry was posted in Under the Cover of Prayer and tagged Blog hop, blogs, focus, God, illustrations, Janis Cox, new works, Ruth Snyder, writing on March 24, 2014 by JanisCox. Blog Hop for Writers – What Genre Do You Write? I started writing by journalling. I wrote what God showed me through His Word, and through people I met. In the first couple of years of journalling I wrote over 150 poems along with questions, words from the Bible, quotes and what eventually turned into posts. I asked God, “What’s up”? Here is one of the first poems I wrote (unedited) called Meditation. Envelope me with a warmth and peace. As You hold me in a spell-binding embrace. I hold on to the moment. I thank You for all Your blessings. I remember others to You. We are together, we are connected. I must return to my daily tasks. After writing all those poems, I started to write devotionals and had two published in The Upper Room – A Pottery Lesson and Quiet Moments. At the same time, I started two blogs, Spirit-filled Canada and A Better Way. (These are both closed now). Spirit-Filled Canada started because I wrote a companion Bible study for Ed Hird’s book, Battle for the Soul of Canada. You can have a free copy as an e-book by writing to me. (Janis). A Better Way started after I wrote a midrash of the story of Mary and Martha. From that story I started a children’s story about Mary and Martha and did some watercolour pictures. That story is still in the vault. Then I heard God’s voice saying to start a different blog. This time focussing on prayer. So I started Under the Cover of Prayer. It has been running since 2010 with many contributors and guest bloggers. Then one day while journalling, a little story about a turtle flew off the paper. That story morphed into Tadeo Turtle where I did the illustrations and published it in the fall of 2012. Next came a website with a blog called He Cares for You because I needed to build a platform. What genre do I write? I have written poetry, fiction, non-fiction, devotionals, Bible study and a children’s book. So my answer is – I have no idea. I write what God calls me to write. He inspires me. I try to listen where He is leading me in my ministry to “feed His lambs”. God is in charge of what I write. Joy comes from seeing the complete fulfillment of the specific purpose for which I was created and born again (Oswald Chambers). What has God called you to do in your life? We each have to find a niche in life, and spiritually we find it when we receive a ministry from the Lord (Oswald Chambers). Ask Jesus to reveal to you what He has called you to do. And LISTEN for His answer. Be ready to move in the direction He is leading. We can do this as we work towards a closer fellowship with Him and strive for Jesus being more than our personal Saviour – He must be our everything. Fifth in a series of a Writers Blog Hop held by Ruth Snyder. Our fourth blog hop was Advice for new writers. Click on the icon to read more posts on What Genre Do You Write. Don’t forget to join the others at Blog Hop number Five. This entry was posted in Prayer and tagged Bible study, Blog hop, children's book, fiction, genre, Janis Cox, non-fiction, poetry, Ruth Snyder on March 10, 2014 by JanisCox. Fourth in a series of a Writers Blog Hop held by Ruth Snyder. Today’s post is Advice for new writers. Click here to read more posts. I know as Christians we say this but … do we really do it? Whenever you are ready to put words on paper, centre yourself with Jesus. And expect Him to help you. And surely I am with you always, to the very end of the age (Matthew 28:20, NIV). No matter what type of writing you are doing write for God. Don’t write anything that would offend Him or upset Him. Don’t worry about what other people will think or say. They cannot harm you. Don’t look for praise from other people. Write for One alone. If you blog don’t count the hits or the comments – this can be destructive. Lord, my Rock and my Redeemer (Psalm 19:14, NIV). 3. Write from your heart and your experience. Take situations and memories and make them come alive to explain a truth about God. Be real. This is especially true if you write Christian devotionals. Writers’ conferences are great places to learn about writing and connect. The Word Guild puts on a conference in Guelph called Write! Canada and Inscribe Writers’ Fellowship puts on a conference in the fall. Join a small writers’ group. Encouragement and critiques in your writing will help you to enjoy what you do and improve. Join writers’ groups. I belong to The Word Guild, Inscribe Writers Fellowship and the American Christian Writers. 5. Write all the time. And read too. So reading and writing go hand in hand. Certainly if you want to write for a certain publication read and study that publication. 6. Network with other writers. Be sure to seek out other writers – not just to learn as in number 5 but to become friends. Friends help each other out, through prayer, knowledge and comfort. You need that when you write. Writing is a solitary experience so we need to reach out to others to broaden our horizons. Don’t forget to read other blogs on the same topic. Ruth Snyder’s Blog Hop Number 4. This entry was posted in Prayer and tagged Blog hop, Christian, Janis Cox, links, New writers, Ruth Snyder, writers on February 23, 2014 by JanisCox. This entry was posted in Prayer and tagged Blog hop, community, fear, five-minute Fridays, free, hero, Holding Nothing Back, Janis Cox, Jesus, Oswald Chambers, peace, prayer, real, Ruth Snyder, worries on February 9, 2014 by JanisCox. I am joining a number of writers in a Blog Hop. This is the first week. Ruth Snyder is running the hop and you can find our first Links on Ruth’s Blog. Every other Monday we will continue the blog hop. I hope you join us in writing and/or reading the posts. I would encourage you to sign up for my monthly newsletter. Receive a free ebook – Living Life – One Word at a Time. See the Sidebar for instructions. Thanks for the template to Melanie at Only A Breath. My writing and my artwork twirl together. As I am led in one area the other one seems to follow. Goals and plans are made but must remain open to God’s leading. I have tried writing schedules and except for my morning times, something always seems to interrupt them. Being retired (read realignment), means my time is my own (not) – or should I say it is God’s time. As He inspires me and as He leads me I follow. Each year I try to find One Word for the year that God has given me. In 2012 it was TRUST. In 2013 it was LIVE. After much prayer, study and listening I have decided that this year will be the Year of FOLLOW. This entry was posted in Prayer and tagged 2014, artwork, Blog hop, Follow, Janis Cox, One Word, personal goals, Ruth Snyder, writing on January 13, 2014 by JanisCox.